As a community bank, Pioneer Bank gets to know our customers on a personal level. This way, we can be sure to help you with the products you need and that will help simplify your life. We are proud to offer Completely Free Checking, Bill Pay, Internet Banking, Mobile Banking, Pay Other People, Commercial and Consumer Loans, Mortgages, and so much more! 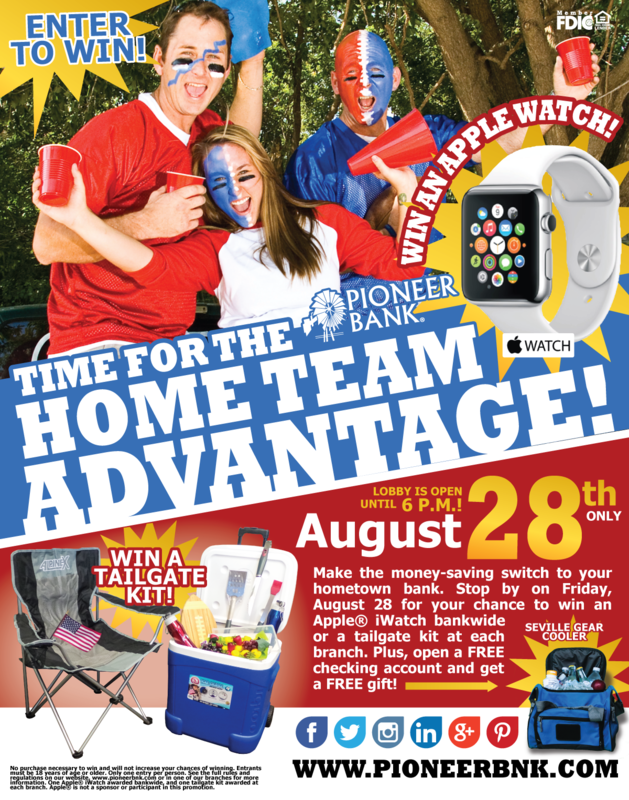 To celebrate our customer’s loyalty and to encourage others to see all that we have to offer, we are excited to show you what the Pioneer Bank Home Team Advantage can do for you! Stop in to one of our locations any time on August 28 (we are even staying open until 6 p.m.!) and you can enter to win an Apple Watch or a tailgate kit! Invite your friends and family by sharing this! Tags: apple watch, applewatch, bestbank, winner. Bookmark the permalink.